With an eye since 1988, My Neighbor Totoro is an animated film about a mysterious forest god who look after and helps two innocent girls, Satsuki and Mei. This is considered one of Ghibli’s most famous works, and is also a classic animated film enjoyed by many generations. 11 year old cute and full of personality. Although she was young, she knew how to take good care of her family instead of her mother. Satsuki pretty pretty compared to other girls in the class. She has short hair and a slightly raised forehead, her face is very similar to her mother. Satsuki’s sister, 4 years old. In general, she is a hyperactive, active, courageous child. Mei is very close to her sister, although always cheerful but in her heart very miss her mother. In contrast to Satsuki, she has a fatherly face. Satsuki & Mei’s father. Mr. Kusakabe works at the University, is a good father, loves his wife and children and caring for his family. Mother of Satsuki and Mei, a gentle, beautiful woman. Because she is quite sick so the whole family has moved to the countryside with the hope of fresh air will make her healthy. A classmate of Satsuki in the village school, the son of a poor peasant family who has feelings for Satsuki. Since he is shy, he treats her rather gruffly but kind. Kanta is Nanny’s grandson. A gentle neighbor from the Kusakabe family from the day they moved to the countryside. She often takes care of Satsuki and Mei when she is away from work. The god cat protects and administers the forest near the village of the two Kusakabe sisters, only children will see it. 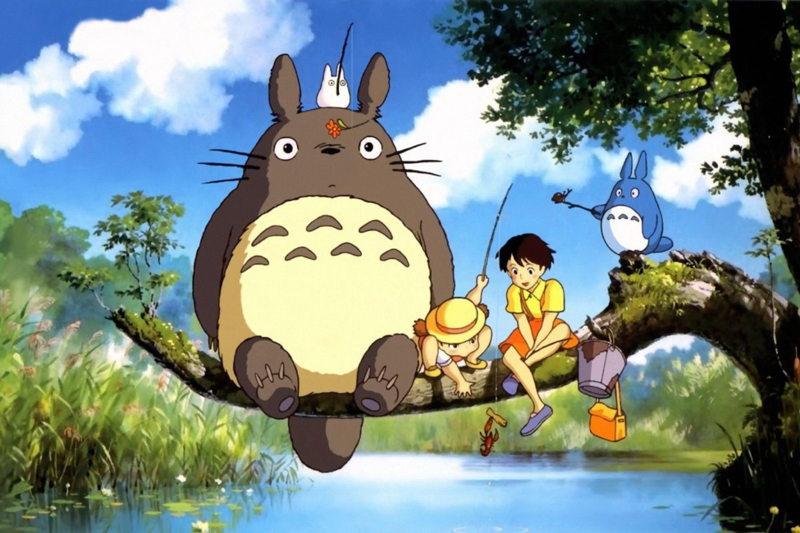 Totoro has the ability to make trees grow faster, fly and call cat buses. Two small Totoro always follow the big Totoro. Chū Totoro looks much like Totoro but is much smaller. Chibi Totoro is the youngest, white. Totoro’s special cat-shaped bus. It can go very fast on any terrain. Besides the Kusakabe sisters, no one can see it. The characters in the movie are very kind, close and simple. Perhaps it is because of this that it is loved by both children and adults. How about you? Do you like them? Do you like a Totoro T-shirt, a Totoro box or a Totoro toy? The best way is through the cute merchandise of Ghibli.